Whether you’re a DIY geek or someone who has a small shop and repair business. You will always need a reliable, safe and heavy-duty staple gun to get the job done. Question is: Do you know what to look for when choosing the right staple gun that fits your need? There’s actually a few things you might want to know and explore as we try to go over the basics and must have for your staple gun. Choosing the best staple gun is critical in order to ensure you’ll have a smooth, effective, and problem-free workflow. It should be able to drive staples into several surfaces such as wood and plastics. We’ve created this buying guide to help you narrow down your choices and get the right handtool you need. We’ll go over the basic features it must have and other things added. 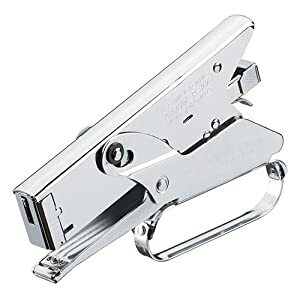 We also created a summary comparison chart for the top ten best staple guns as of 2019 to serve as an overview. After that, just continue reading for the next part will be an in-depth review of each of the product’s features, benefits, and setbacks. Hopefully, in the end, we’d be able to help you arrive at a good decision. Features and Benefits to be considered. Benefits: This handtool is very portable and you don’t need any power cord or compressor gas tank to power it up. It gives enough versatility and flexibility for work. No problem when loading it with staple wire. Likewise, it’s really budget friendly and good for quick jobs at home or in your shop. Setbacks: Mostly, work effectivity will depend on the user’s strength. Moreover, it will be tiring if the work takes quite some time to finish. Benefits: This type can either be battery-operated or corded electricity-driven. In contrast to the manual, you need little strength when using this hand tool. It also offers portability and versatility like the previous type. Using this tool, you’d be able to work for long hours without letting your hand get tired. Setbacks: Portability of the tool is dependent on the battery life for cordless ones, while it will be the power cord's length for the corded-electric type. It is more expensive compared to manual staple guns. Benefits: This one offers more power and works accuracy compared to the two previous types. It offers a more effective and efficient performance. Likewise, it requires easy maintenance. Setbacks: This type operates on a noisy sound level compared to the first two. It’s actually more expensive than electric staple guns. Portability will greatly depend on the length of the air hose which is connected to the compressor gas tank. The bottom line for most handtools is the comfort for the user. There’s a variety of specifications that you need to look for and it must deliver comfort. These specifications can be in terms of shape, size, weight, and grip handle. A few units of this tool comes in affordable prices and good quality but some have bare metal handles. A bare metal handle will be uncomfortable in the long run, particularly when working for long hours. Your hands get sweaty and later on, you’ll have hand fatigue and can no longer hold the tool well. In order to avoid that, better choose a unit with a soft rubberized grip handle which fits your hand. Some of it also have extended handles, in case you’ll more force and use two hands for the job. Further, choose a staple gun which is lightweight in order to avoid hand fatigue for long hours of work. You choose the staple size depending on the surface you’re working on. The common staple size for home and office would be 26/6, 24/6, 24/8, 13/6, 13/8 and Number 10 for mini size staplers. On the other, heavy-duty sizes include 23/8, 23/12, 23/15, 23/20, 23/24, 13/10 and 13/14. Advance features are incorporated with electric and pneumatic staple guns. These types have dials so they can easily change them and fit the available staple size. Further, it comes with another function which controls the depth at which staple is shot. This comes quite useful when you’re securing wires or cables on any surfaces. This feature can be linked to convenience. A handtool which is easy to use will have an ergonomic design, soft-rubberized grip handle, and lightweight. Buying any handtool is honestly an investment that you don’t want to waste. The durability of a unit covers the quality of the material, buttons, and controls, and it doesn’t easily get burnt when used for long hours. Moreover, you also need to look at the length of the warranty service in cases you’ll be using it. It has a Quick-jam-clear action when the staple wire’s stuck inside. First, hold the switch on the side then pull down the metal drive channel. Look for the stuck staple wire inside and take it out. Return the drive channel. 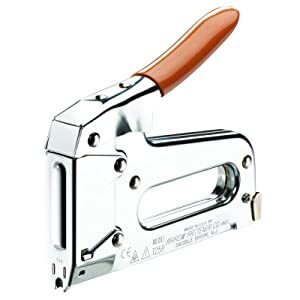 The package comes with the 1*staple gun, 600* Door-type staples, 600*U-type staples, 600*T-type staples, and 1 box. This tool comes pretty handy when you’ll need to repair something at home. It has a small and compact body which makes it easy to maneuver and reach narrow spaces. It’s small yet delivers pretty powerful stapling actions that can pass through the wood. It comes with three staple styles (D, U, T-type) which definitely adds more value to its function. However, it would have been easier if there was an instruction manual included inside the package. Aside from heavy duty tasks, it's also good for delicate jobs like on fabrics and upholstery. Its anti-slip rubberized grip handle comes quite useful, particularly with sweaty hands. Overall, this staple gun offers a really good function for an affordable price. Its body is completely made from steel for extra-strength to resist wear and tear. Chrome-plated finish coatings to give that sleek professional look. It has a deep guide notch which allows you to shoot the staple without scratching the cable. Less trouble with stuck staples due to its jam-resistant mechanism. To remove jammed staples, first push in to remove the pusher and slide it out of the tool. After, clear the jam using a screwdriver then insert a full strip of the staple into the channel. Lastly, reinsert the pusher back into the guide rail. This staple gun and cable fastener looks really solid and works pretty well as it claims. You can use the “clear” Arrow Fastener 591189 Genuine T59 Insulated 5/16”x5/16” staples with this one. It does a flawless work on tacking network cable without hurting a single wire. If the larger size staples seem annoying, then use the smaller ¼”x1/4” staples. For those who experienced having staples not being driven all the way in, I think they got a defective one. This tool uses a staple wire which has a plastic end to hold the wire down without hurting it. Upon driving the staple into the surface, there’s a really small gap between the wire and the staple. It’s actually a good thing for that provides enough space for extra wire movement. It also has a deep guide notch which allows you to shoot the staple without scratching the cable. If you hate to see loose and sloppy placed cable wires, you can use staples with sizes smaller than 0.25 inch. In general, this staple gun works amazingly as expected and a good investment. For RG6, you can use a ¼”x1/4” staple size. This unit can’t accept non-cable securing staples. This unit is not intended for stapling flyers, instead, use the T50 stapler gun. It comes with 3-staple styles (200pcs for each type - D, U, T types) for added functionality for small and medium works. It has a steel handle wrapped around with soft rubber for comfort and a firm grip. It also has a safety lock feature for the handle when the tool’s not in use. It includes an instruction manual and staple remover inside. It works really fine and the product’s packaging looks sweet and beautiful and an after-service card is included. The packaging is as good as the product itself. The instructions on how to use and reload the staples are on the packaging itself. The 3-staple style included with the tool adds more functionality for home decorations. Staple wires are good, doesn’t easily bend when shot at harder surfaces like the upholstery. 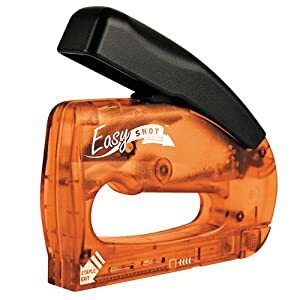 It’s also a good thing that it comes with a Quick-jam-clear function for it’s really a headache when staples are stuck inside. Its grip handle is covered with soft rubber which gives a firm grip and comfort when working. The dial knob works fine when you need to adjust the pressure when the staples are shot. It also has a rectangular metal locking feature which secures and holds the handle in place when not in use. In totality, this staple gun’s worth the price, works perfectly neat. 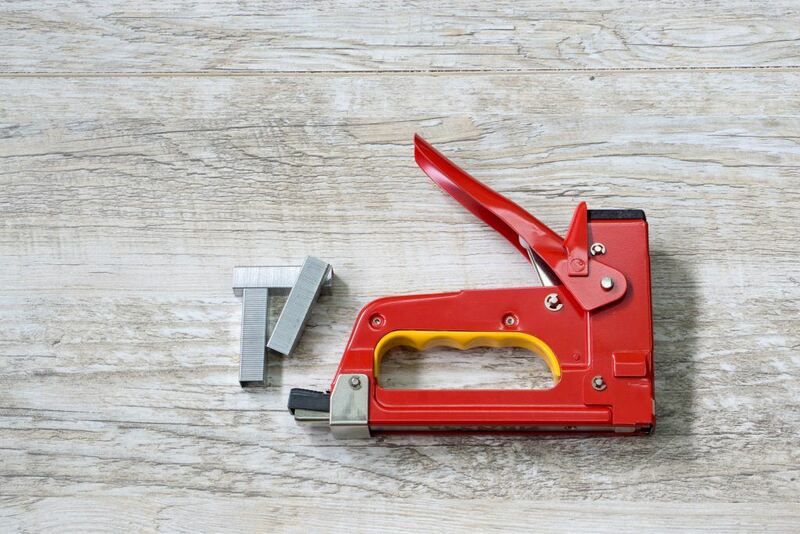 The Swpeet Manual Staple Gun comes with a stapler remover and 3-staple types for extra versatility. This is a perfect kit for your simple and easy stapling works in the office or at home. It is slightly heavy (2.0 lbs) which can surely hurt your hand and wrist if it ain't that strong. It requires initial load and extra hand strength for deeper penetration into the surface. 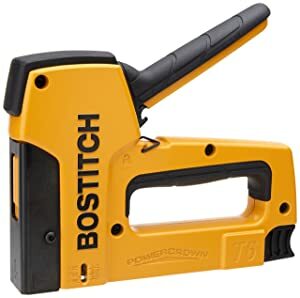 The BOSTITCH T6-8 Heavy Duty Powercrown staple gun is another decent tool crafted by Bostitch. It works pretty much the same way as any other manual staple guns. One good thing about it is there’s less staple jam compared to other counterparts. Even though it requires an initial load factor and extra hand strength, this ensures more depth in every shot. Some users said that Bostitch staples are not good for this unit because of its blunt ends, I would say otherwise for it just works fine. The right staple size for this unit is STCR5019 Powercrown staples with sizes: ¼”, 5/16”, 3/8”, ½”, 9/16”. Now let’s go over the rough side about this tool. One setback with this package is that there are no staples included. The unit is sturdy and strong. However, its quite heavy and surely your hands and wrist will hurt after 2 to 3 hours with this tool. It’s preferable for a person with strong hands and a firm grip. Likewise, good thing the handle is insulated with molded rubber for a comfortable grip. Nevertheless, this one is really good stuff and a good tool. 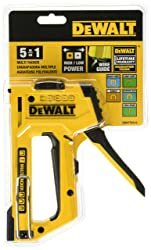 This manual staple gun seems to be of good value and amazingly staples thicker bags. For others who experienced head jams, I guess they bought the wrong staple size. It pairs perfectly with the P22 staples ¼”x5/16”. The staple head has a deep guide for the staple wire to be consistent on its shot. Its hand guard loop perfectly fits and there’s not much force to exert when you start stapling. This unit looks really professional with its chrome-plated exterior and it gives extra protection against rust. How to Clear Staple Jam in P22 Staple Gun? First, remove the pusher by pushing in to unlock and slide it out of the tool. Next, remove the channel, press the tab and push the channel towards the front of the tool. Pull out the entire channel, clear the jam using a screwdriver. Reinsert the channel and line up the tabs. Make sure the knife assembly is in the up position and lines up with the tab in front of the tool. Insert a full a strip of the staple in the guide rail and reinsert back the pusher until the box in place. It can pass through leather. The page capacity for stapling is around 8mm and it can pierce through 12 sheets of paper. The Arrow Fastener P22 Heavy Duty Plier Type Staple Gun works great on your counter, shop, office or home. Its plier type design enables it to staple narrow spaces on your work. 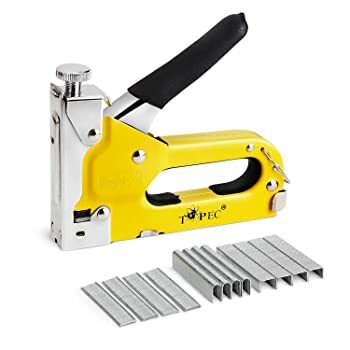 This manual low voltage wire staple gun is built from steel and with a smooth chrome exterior coating for a professional look and extra resistance for wear and tear. 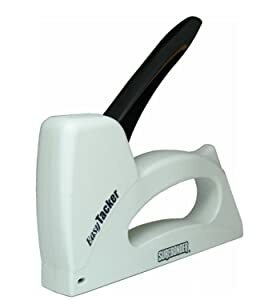 It delivers consistent and reliable stapling with its curved blade and uses tapered head staples to protect wires against scratch. The really good thing about this tool is it’s a perfect partner when you’re doing low voltage wire applications such as security cam, garage doors, and alarm systems. It can pass through hard-pressed chipboard but not much for upholstery. Even though it can’t get much closer to the corner of any surface to meet 90-degree angle, it works pretty neatly on straight-line shots. It doesn’t pinch any wire for it uses a tapered head staple. Likewise, it leaves a very small gap in between the wire and staple head for extra little movements of the wire. It’s also lightweight and easy to press so its good for your wrist and hand. This is a really neat tool for coax and UV resistant CAT6. In general, good tool investment. Loading the staples comes quite easy. You’ll just drop it inside the space allocated in the tool’s body, no more sliding out a channel. You can carry this manual staple gun anywhere and any time for its conveniently lightweight and space-saving. Surprisingly, for a plastic-built staple gun, this one goes with the least chance for jams. Loading the staple comes really easy. No need to pull out a sliding channel. There’s a space created in the tool’s body where you’ll just drop the staples for reloading. It can work on upholstery and furniture but you need to apply more force which is manageable. It can withstand great force when you’re stapling on furniture or similar surface. All in all, a good economic tool and works pretty fine. 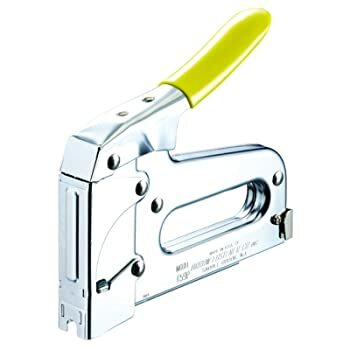 Aside from doing the same staple work, it offers good quality and affordable price for a light duty staple gun. • How to load the staples? This unit accepts 5 types of staples for multiple functionalities. It uses both crown staples and brad nails. It has a sliding switch button at the front head of the tool which used to switch the kinds of the staple to be used. Slide it up for heavy duty staples, while sliding it down for light duty staples. It also has a sliding power switch button on top of the handguard loop. Slide the power button towards the minus (-) position for lighter shooting. Slide it on the positive (+) position if you want a deeper shooting for staples. This unit has a steel belt clip which you can use to hang the tool besides your belt or inside your pocket. Let’s first look at the good stuff about this unit. This tool has a good strong spring system for effective craftsmanship and shooting of staples and nails. It has a strong plastic housing and the handle is of good length for better grip and handling. Likewise, it has a molded rubber cover on the upper portion of the handle. Excellent for hand comfort. They’ve added a power switch high/low function. This comes useful when you’ll be working on various surfaces. For harder surfaces, like furniture, you have it on high power for a deeper shooting. Otherwise, use low power when working on delicate things like wires and cables. Now let’s go over the rough side of the tool. Some experienced their staples jamming or shooting out. Perhaps, they did something wrong with the loading process. Moving on, the latch which holds the handle when the tool’s not used seems to be annoying because sometimes it locks up while working. In general, this tool is still worth an investment for your shop or home. This tool is housed with hard plastic which can incredibly hold up enough pressure which is designed to work on. It can handle light and sensitive works like securing wires without pinching them. It accepts the staple size of T50 ¼”x9/16” narrow crown staples. The slide out a channel for staple loading is at the front head of the tool. It has a slide switch button for high or low shooting action. The minus (-) will be for light shooting while the positive (+) is for heavy duty shooting. This tool relies on your body weight rather than the grip when using. Its body is housed with hard plastic which actually holds up with a high-pressure application. It works perfectly fine with light tasks such as installing outdoor lightings. The tool’s design exerts pressure where it needs to be to have an effective shooting depth of the staple or nail. So far, this staple/nail gun delivers effective shooting depth because the pressure applied is in line with the staple. One setback is it can’t use nail crown molding. In totality, this one is a good trade-off for a staple and nail gun. The Craftsman Manual Staple and Nail Gun will be an ideal tool suitable for construction, carpentry, home use, and many more applications.